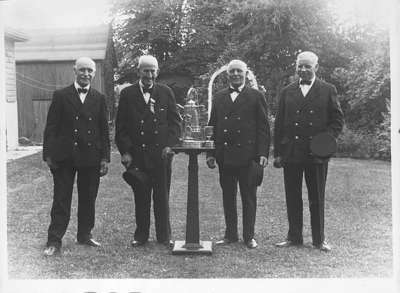 Black and white negative of a photograph of four of the oldest members of the Whitby Fire Department pictured with a silver coffee urn that was awarded to the Whitby Fire Department at a firefighters convention in Port Hope in 1889. The urn was acquired by antique collector Gertrude Drew and she bequeathed it to the Whitby Fire Department on her death in 1990. From left to right: George Mowat, William H. Smith, William Thompson, and Arthur G. Hopper. The photograph was taken in the backyard of Honorary Fire Chief William Smith located at the north-east corner of Euclid and Mary Streets in order to celebrate the 50th anniversary of winning the silver coffee urn. Oldest Members of Whitby Fire Department, 1939, Marjorie Ruddy. Whitby Archives 08-005-005.